Welcome to my 2019 travelogue pages. 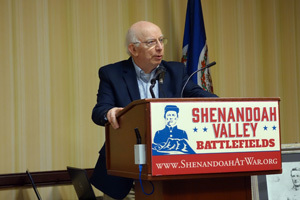 This is my report of the Shenandoah Valley Battlefields Foundation (SVBF) annual meeting, “Give the Enemy No Rest, Sheridan's 1864 Shenandoah Campaign.” These conferences are always well done, and this third one for me was no exception. To see the entire list of my 2019 trips, go here. Here is a reminder about the reason I write these pages the way I do. 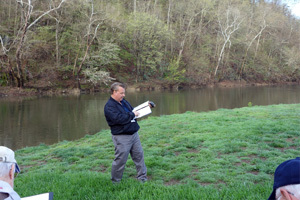 They record my experiences and impressions of Civil War trips primarily for my future use. 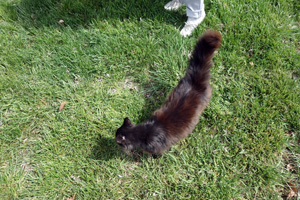 Thus, they sometimes make assumptions about things I already know and focus on insights that I receive. They are not general-purpose descriptions for people unfamiliar with the Civil War, although I do sometimes link to various Wikipedia articles throughout. Apologies about the quality of interior photographs—I don't take fancy cameras with big flashes to these events; these particular ones are taken with my Sony CyberShot DSC-RX100. On this 154th anniversary of Lee’s surrender, I flew United Airlines from San Francisco to Dulles. I rented a car and drove about 75 minutes to Front Royal, checking into the conference hotel, the Holiday Inn “Blue Ridge Shadows,” which is actually a very nice, large hotel, catering to nearby golf courses. Today was the first of three all-day bus tours and I was surprised to see that we filled three large buses—more folks than I have seen at previous conferences. 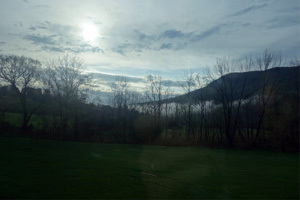 The weather was perfect—mid 50s to 60s, and sunny. 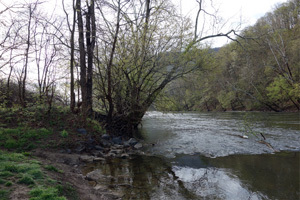 We drove to the Winchester vicinity and out the Berryville Pike (Route 7) to the crossing of the Opequon River, where the first action of September 19 started, as the 1 CT Cav crossed and engaged the 37 VA Bn. We walked a ways on the original Berryville Pike, which deviates from the modern highway quite a bit. Scott Patchan told us the background of the campaign. I did the maps for his book, The Last Battle of Winchester, and all of the attendees got nicely printed color versions of the maps. I received compliments all day from map admirers. 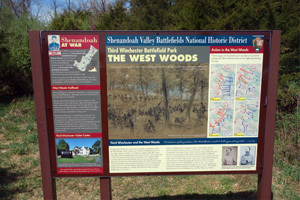 Many of the newer battlefield signs included my color maps as well. We drove to Berryville and turned north on US 340 for a relatively long drive through Summit Point to Locke’s Ford, and then on to Brucetown, where we dismounted for a explanation by Scott about the various crossing points used by the Union cavalry, and the fight between Merritt and Breckinridge/Wharton. This fight delayed the Union cavalrymen all morning, which had ramifications for the infantry battle starting to the west. 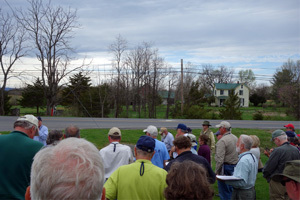 Next was the Dinkle farm to discuss the fighting by the US VI Corps along the Berryville Pike. Unfortunately, this area is mostly lost to development, right in the middle of a shopping center. There was a trail leading into what will someday be the south entrance to the general battlefield park, but the 150 of us did not enter. It would have been too logistically clumsy and there are not yet any signs installed. We enjoyed a box lunch at Clear Brook Park, which is pretty and has lots of picnic tables in covered pavilions. 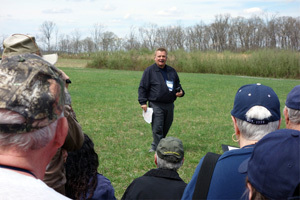 We drove to the Middle Field, where Gary Ecelbarger told us about the attacks by the XIX Corps. 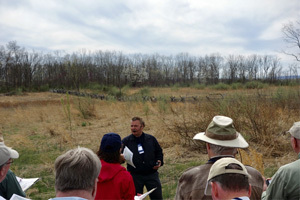 He had the 150 folks line up to illustrate how wide a typical Union regiment front would have been at Winchester. The constrained area showed us why only two brigades could advance together. We were facing the Second Woods, which are only about half their historic size. The southern part of this area is reduced by a large housing development, mostly manufactured homes, that was constructed before preservation efforts started up years ago. 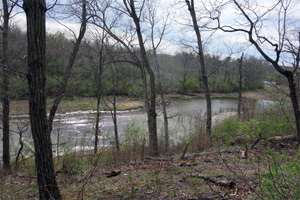 In their midst is a large pond that was once Ash Hollow, a battlefield feature. As we wandered north, we reached Red Bud Run, which is in a much steeper ravine than I had envisioned from the contour lines on my maps. Gary outlined Crook’s Army of West Virginia attack. We bused to the Huntsberry farm on the north side of the run and walked to the spot where Rutherford B. Hayes led his 23 OH across. Scott said that the run was 60 yards wide during the battle, considerably wider than the little trickle today. 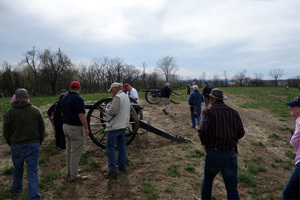 There is a group of three replica cannons to memorialize the Confederate artillery in that position—Breathed’s battery. We finished up at the building that will someday soon become the SVBF Winchester Visitor Center. Keven Walker described the plans for the building and the outdoor exhibit/plaza, but we didn’t go in. On the way back we passed by Fort Collier, which anchored the Confederate left in the final hours of the battle. But because nothing else is preserved in that area—the Fort Collier Business Park—we couldn’t see any artifacts of the final Confederate defensive line. Instead we drove through downtown Winchester pointing out local sites of interest. At the hotel we had a reception with significant hors d’oeuvres, rendering dinner unnecessary. 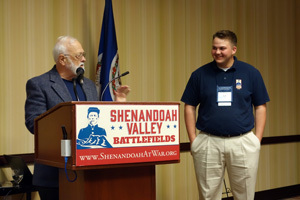 Nicholas Picerno, the chairman of the SVBF board, gave a brief speech describing his collection of 20,000 artifacts relating to the 1/10/29 Maine (all the same people in successive enlistments), which he generously bequeathed to the Foundation. He said it’s the largest single-regiment collection known, and Keven Walker said it was valued at over $1.6 million. A couple of dozen artifacts related to the 1864 campaign were on display, all in pristine condition. 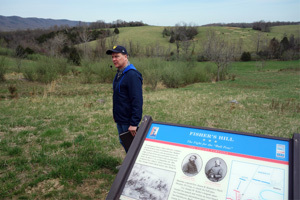 I did not predict that it would be possible to spend a full day on the battle of Fisher’s Hill, but the day came and we filled up most of it with a lot of interesting stops and commentary. 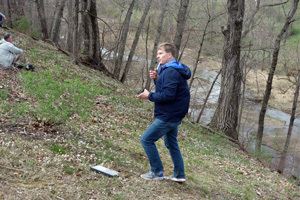 Keven Walker told us that the SVBF has protected 600 acres, either through purchase or easement, and they are working on a trail system to connect all the pieces together and to Strasburg. 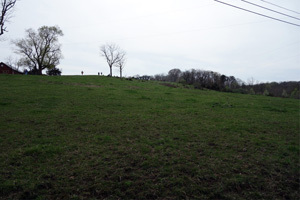 We started close to the right flank of this “Gibraltar of the Valley,” on the hill called Wharton’s Hill, which was defended by Gabriel Wharton’s division. 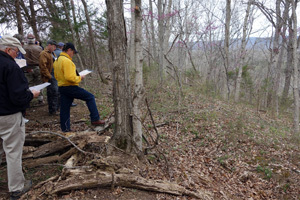 (Although this is called Fisher’s Hill, it is actually a ridge that strings together a group of rather distinct component hills, and many seem to be named for the Confederate divisions that stood on them.) We climbed up a moderate slope—quite a bit more moderate than our guides warned us about—and Gary Ecelbarger gave us a geographic overview to orient us. This was the strongest geographical position on the ridge, but yet Early unnecessarily put some of his strongest units here. At the other end of the line, where the geography was the weakest, Early put Lomax’s dismounted cavalry, his weakest unit. We saw some eroded earthworks that were defended by George S. Patton’s (the grandfather of the WWII general) brigade, although Patton himself was mortally wounded back at Winchester. We discussed the 1864 location of the Valley Pike, which crossed the hill a bit farther west than the modern road. There was also an artillery lunette. Gary opined that Jubal Early should not have attempted to defend on this line—he had too few men, working out to be 4 men for each 5 yards, with no reserve. He should have learned from Stonewall Jackson’s 1862 behavior and withdrawn farther southwest to recover. 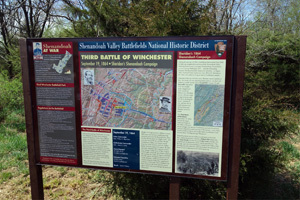 We drove west on Junction Road and then southwest on Back Road to the Baker Farm, where Scott Patchan described Crook’s two-hour march along Little North Mountain to set up the flanking attack by the Army of West Virginia. 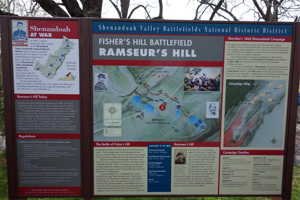 Next was Ramseur’s Hill, which is nicely outfitted and interpreted by the SVBF. 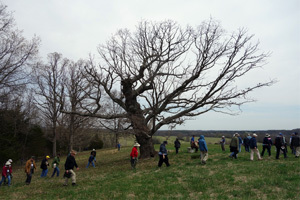 At the top is Ramseur’s Tree, a giant oak witness tree that had its top cut off so that a signal platform could be mounted on top. 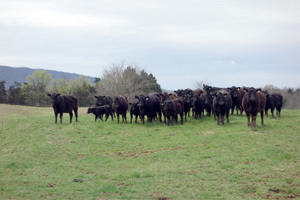 There were no visible earthworks—the farmer who once owned the land bulldozed them away because too many of his Confederate cows broke their legs. We had a nice box lunch at Shenandoah County Park, just south of Tom’s Brook. (We did not cover the battle of Tom’s Brook for logistical reasons—time and bus access issues.) Our final stop was Gordon’s Hill, which was a good deal steeper and taller than the other two, but had a great panoramic view of the surrounding area. 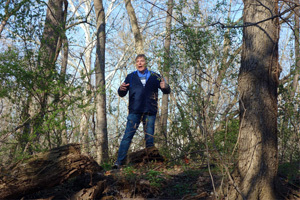 (Scott likened it to Lookout Mountain’s view, but that was a dramatic overstatement.) There was a working dairy farm on top, and we intermingled with a number of pretty cows and a very friendly old dog. We got back to the hotel at 4:30, having enjoyed another great day. We had the evening free, so my friend Harry and I drove to downtown Front Royal, where we dined at the Front Royal Brewery, which had an excellent beer selection and decent pub-style fare. Today was lecture day in the hotel ballroom. Scott C. Patchan: No Mimic About It: Battles from August 17–September 18, 1864. Scott started with the political background in August 1864 and then covered all the minor battles between Early and Sheridan before Winchester: Signal Knob (skirmish), Guard Hill, Bower’s Hill, Early’s Charleston Offensive, Kearnysville, Shepherdstown, and Berryville. All were illustrated by maps I did for his book. He said that Early underestimated Little Phil, who was holding back any big battle until he knew Anderson’s division left the area. Robert K. Krick: The Confederate Pattons. This was another in a long series of entertaining, humorous talks by Bob. He covered the Patton heritage starting with Hugh Mercer of the American Revolution. George S. Patton I was born in Fredericksburg, where his birth house still stands. 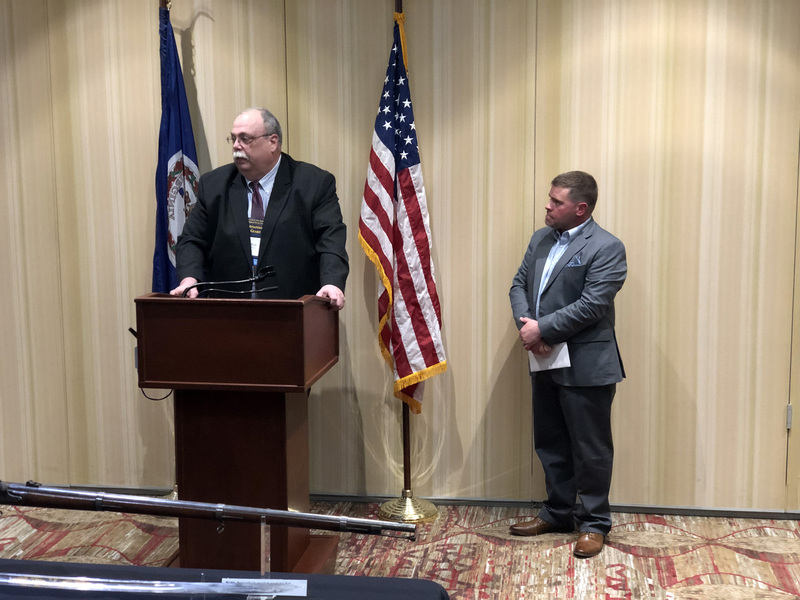 Bob talked about three Pattons in the war (and one cousin, Isaac Williams): John Mercer Patton Jr, prominent in the 1862 campaign; W. Tazewell Patton, mortally wounded at Gettysburg; and GSP I, the grandfather of GSP III in WWII, mortally wounded at Third Winchester. The latter fought mostly west of the Blue Ridge, except for a defense of Dahlgren’s Raid and then at Cold Harbor. Jonathan A. Noyalas: "'Faded... From the Memory of the Average Reader': The Meaning and Legacy of Fisher's Hill." 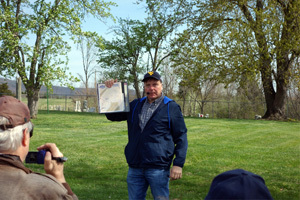 Jonathan (who has never used my maps, the rascal) described how Fisher’s Hill repaired the Union’s damaged morale, much more so than Third Winchester. It also began the sink into despair for the Confederates. Henry Kyd Douglas described it as the Valley of Humiliation, a term he said once applied to the Union situation. 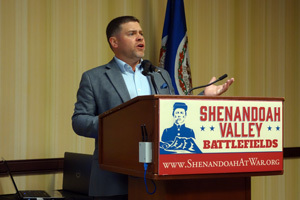 Jonathan described the widespread lamentations after the death of Sandy Pendleton. He also said that, despite wide criticism of Early, Robert E. Lee didn’t censure him for his losses. 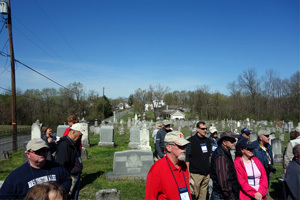 Fisher’s Hill was a big draw for veterans’ reunions. 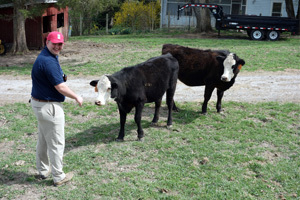 Before lunch, Craig Morin announced a scholarship program he is sponsoring, and the first recipient was Jack Owens, a high school student who has worked as an SVBF volunteer (and who communes with cows, as shown in a photograph from yesterday)—a very nice and capable young man. William J. Miller: Cold Blood: Cavalrymen, Civilians and the Burning. I did the maps for Bill’s book on Tom’s Brook, but I had never met him until today. 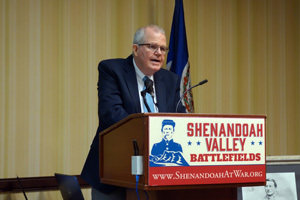 He talked about the Burning, Phil Sheridan’s destruction of military-relevant civilian properties, including 700 of the 4500 Valley barns, 60ish mills, and as much as 45% of the wheat. He said that house burning was essentially “fake news” in the Southern and Democrat press. The small number of house burnings can be attributed to retaliation for guerrilla actions; accidents; or criminal acts. US Grant throughout the war established that denying the enemy armies access to harvests and livestock was appropriate, but he took steps to ensure the process would not be misused. In response to my question, he said that David Hunter, in contrast, did burn a number of houses as purely punitive actions. 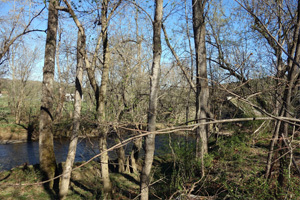 Jeffry D. Wert: When 'Old Jube' Lost Cedar Creek. Jeff described the strategic situation and then jumped into a high-level talk about Cedar Creek (assuming we would be on the detailed tour tomorrow). He said that Robert E. Lee did not appreciate the odds against Early. The key to the battle was to control the Valley Pike, which Early failed to do; this was a bigger problem than the famous “fatal delay” in attacking the VI Corps. He said that Sheridan sealed Lincoln’s election, but that he’d rather spend the afternoon drinking bourbon with Old Jube than with Little Phil (a liar). During the Q&A he opined that because of all the Overland Campaign losses, the only well-experienced troops left in the Eastern Theater were the federal cavalry, which greatly outmatched their gray counterparts. Caroline E. Janney: After Appomattox: How Mosby’s 1864 Raids Shaped the War’s End. Carrie (who has used my maps—yay!) 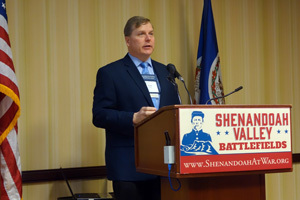 gave an interesting talk about how partisan/guerrilla units were not covered by the surrender agreement at Appomattox. (She said that partisans were technically CS Army units that worked in concert with the regulars, whereas guerrillas were local groups pursuing their own goals. However, much of the public used the latter term to apply to all these guys.) 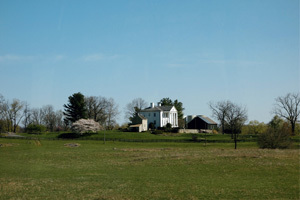 There were about 20,000 troops in the Army of Northern Virginia who were not paroled at Appomattox, but Grant wanted them treated in the same gracious way, so ordering Winfield Scott Hancock, Middle Military District. Hancock publicized this, but said it did not apply to Mosby personally. After the Lincoln assassination, Mosby disbanded his 43 VA Bn, and they mostly surrendered individually. He was still a wanted man, but Grant stepped in and paroled him June. Keven M. Walker: Concluding Remarks: Little Phil’s Legacy in the Valley. Keven skirted around the legacy topic and conducted a raffle of a painting. 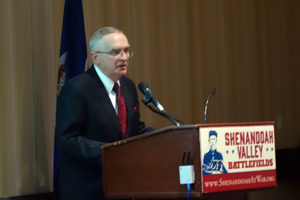 Dinner and program by Lt. Col. Ralph Peters: “Civil War in Revolutionary Times: Change and the Challenge of Leadership.” After the dinner we first proceeded through a variety of awards for philanthropy, preservation, etc. I’m sorry to say I was unfamiliar with the famous people whose names graced the awards. Craig Morin won one—a big medal like a marathon finisher—but I didn’t really follow exactly what it was about. And there were speeches and reminiscences for each award. Keven announced that our fundraising in the conference had succeeded in retiring the Huntsberry Farm debt! 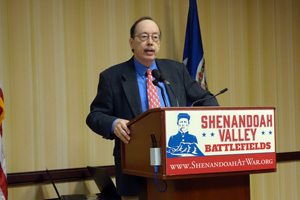 Colonel Peters gave a rather rambling speech, the audience acceptance of which suffered from its late starting time. In short, there was a lot of technology change in the mid-1800s, particularly steam engines and the telegraph. Europe was changing a lot with Italy and Germany formed as new countries. Paraguay had a giant war. Russia was our ally and its ships kept Confederate commerce raiders out of San Francisco Bay (? ), but Putin wants Alaska back and his weapons systems aren’t good. Officers who fought with Napoleonic tactics in the Mexican War didn’t adjust well to tactical changes caused by rifled muskets. Cavalry officers were second class behind infantry, so they were younger and didn’t fight in Mexico, so they were better in the CW. And don’t worry about a civil war in our modern society—we’ve been through worse times and revolutions require lean and mean guys in their 20s, which are pretty rare today. He also managed to include a defense of German troops at Chancellorsville, the subject of his forthcoming novel. Our final day was devoted to the battle of Cedar Creek. Today the weather was best of all. We drove through the town of Strasburg to Strasburg Landing, which is a small park on the North Fork of the Shenandoah River. Nothing happened here other than being a viewpoint for the ridge of Massanutten Mountain on the other side, where we could imagine John Gordon’s troops sneaking along the pig path. Gary Ecelbarger gave us a battle intro. 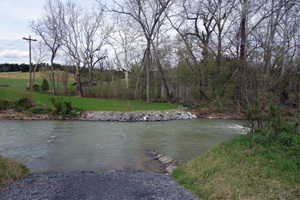 We bused to a bridge very close to Bowman’s Mill Ford, where Kershaw’s men crossed Cedar Creek in the dark and fog at about 5:30 am. 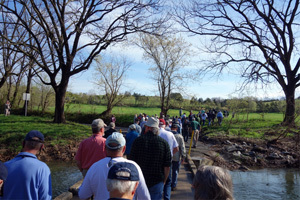 Gary emphasized that since we were near the confluence of the Shenandoah and Cedar Creek, we were on the low ground, and everything on the battlefield would be an uphill climb for the Confederates. He gave us his theory about why the Confederate attack petered out: after five hours, these skinny guys used up all their glycogen and they essentially “hit the wall,” just as a marathoner does after mile 20. (They also had been marching all night without meals.) 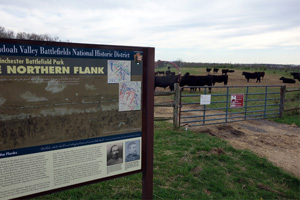 We heard that the battlefield has 900 acres preserved, and about 200 more are in process of being added. 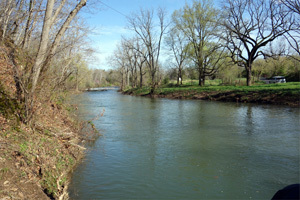 We drove next to Bowman’s Ford on the Shenandoah, where Gordon’s men crossed, and then continued on to the Thoburn position, the AWV troops first surprised by the Confederate attack. Our three large buses had a bit of difficulty maneuvering on some of these narrow, winding gravel roads and we had to do some detouring and backtracking a few times. We were at the position of the Harris brigade earthworks, although they we bulldozed away in the 1920s when they installed the park road. Sigh. We also went just north to Brewerton’s artillery position, which was being analyzed by archeologist volunteers who were scanning to find exact positions for the battery. We headed to Middletown Community Park for another good bag lunch. We drove a long circuitous route and ended up just slightly north of this area, at the Stickley House and Mill on Cedar Creek. Here we discussed Gordon’s and Kershaw’s attack on the XIX Corps flank, as Wharton and the artillery approached from Strasburg. Next was a field on the Belle Grove property—we didn’t actually go into the mansion itself—to discuss Hayes’s defense against Gordon. This was at the 114 NY position, right next to an electric fence that separated us from a small herd of curious cows, who galloped over to see the crowd of 150 people approaching, but lost focus after about 5 minutes of intense staring. 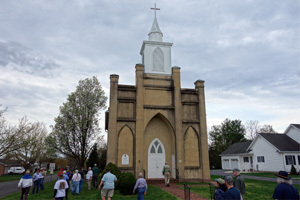 At Meadow Mills (the intersection of Meadow Mills and Belle Grove Roads), we examined Keifer’s defense, which bought critical time for the Union and saved a crucial area. We then bypassed the Middletown Cemetery, which was disappointing because Getty’s stalwart defense there was arguably the key to the battle, leading to the “fatal delay.” But Gary told me that they couldn’t solve the giant three-bus problem. So we drove up to the Dinges House, across the Valley Pike from Middletown Elementary School, where the Union line stabilized and from where Sheridan launched his counterattack. 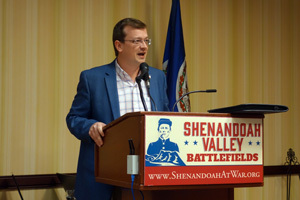 Here Scott Patchan talked about Sheridan’s Ride, the counterattack, the Confederate (orderly) retreat, and the mortal wounding of Stephen Ramseur. This was an excellent program, with great tours, lectures, and overall organization. 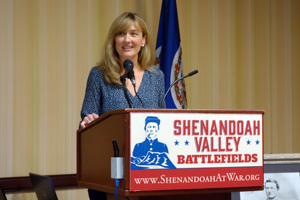 Kudos to the SVBF. 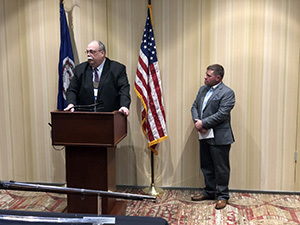 Their 2020 National Conference, "Our Hour Had Come": New Market, Piedmont, and the Fall of Staunton," will be based in Staunton, April 16–18.